Every day you answer questions–dozens, even hundreds of them. How do you find the answers to questions? How can you be sure your answers are correct? Scientists use questions to learn about things. Scientists have developed a way of helping make sure they answer questions correctly. It is called the scientific method. The scientific method can help you find answers to many of the questions you are curious about. What kind of food does your dog like best? Is your sister more likely to help you with your homework if you say please? Can throwing a dead snake over a tree branch make it rain? The scientific method can help you answer these questions and many others. 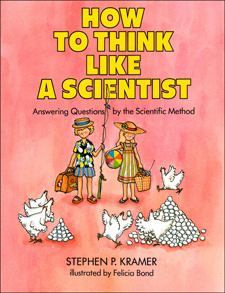 Stephen Kramer’s invitation to think like a scientist, illustrated by Felicia Bond’s humorous and appealing pictures, will receive enthusiastic response from young readers, scientist and nonscientist alike.